I just got back from a nice long visit to see my family in Washington State. This was the longest vacation I have had in over 5 years, so it was really nice to not be rushed and have the time to relax. Of course, it was also a great reason to make airplane bento box lunches! My first bento for the trip from Santa Rosa to Seattle contained falafel from Trader Joes, a few kalamata olives, cherries from the Neufeld Farms, caprese skewers, and spinich bolani made in the Bay Area. Of course, while I was in Washington State, I had to go bento shopping. I found some fun bento boxes for my sister in law, my brother, and even baby sized bento boxes for my little niece. My bro decided to make bentos for us for a picnic to a local winery. I have to admit I got a little bossy and assembled my own bento, so he was kind of peeved. But I really do like his bento, it's the larger black one with the sandwich wrapped in wax paper. 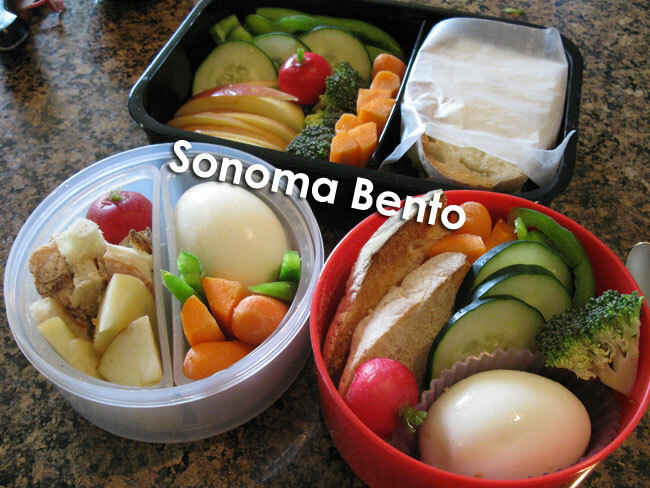 Our bentos had either eggs or egg salad sandwiches, radishes, cucumber, carrots, apples, bell pepper slices, and broccoli. Very healthy! And here's the bento I made for my plane trip back from Seattle. My sister and I stopped at a great asian market in Kent, Washington called 99 Ranch Market. 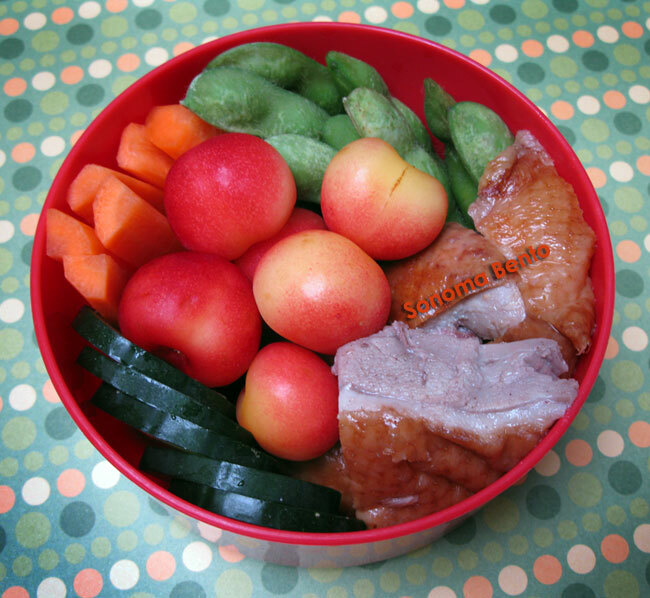 We got some delicious roasted duck, which I included in this bento. Also edamame, carrots, rainier cherries, and cucumber slices. Here's a video of the shenanigans I got up to playing with my little niece. I made shirts for the Aunties to celebrate Auntie Palooza 2011. Hee hee! 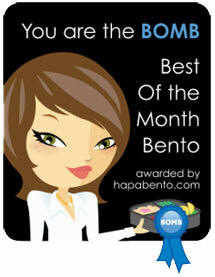 Can't wait to get back to bento making now that I am all rested up. 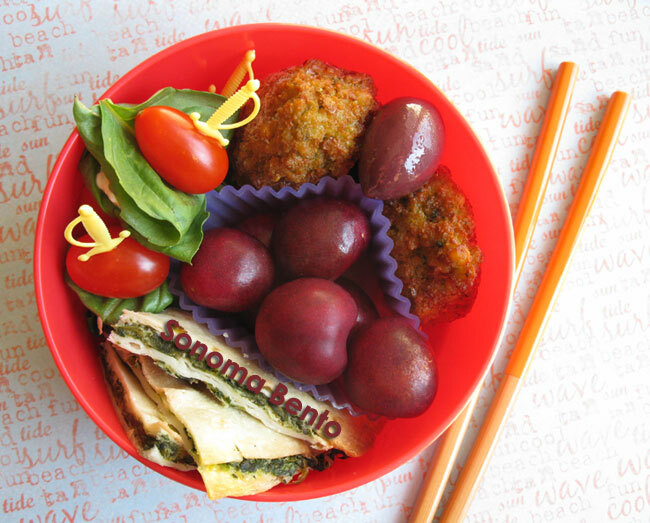 Have a great week bento pals! How cute...such a nice bento. Sounds like you had a fantastic time! So nice to have a relaxing long break with family. Welcome home and back to bento! I like above the recipe. 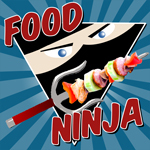 I follow your steps to create this recipe. It's great stuff. I enjoyed to read this blog.